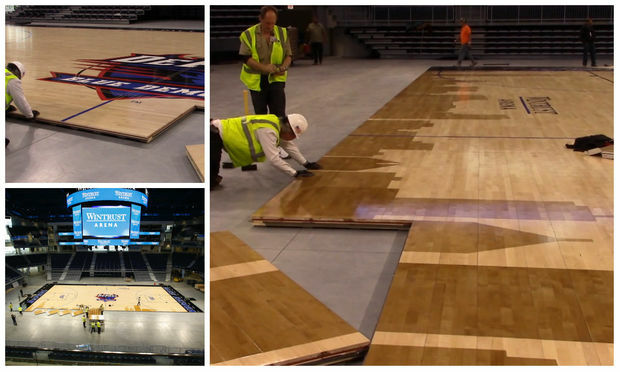 Workmen assemble the basketball floor for DePaul University at Wintrust Arena. DOWNTOWN — How close is the new arena at McCormick Place to being ready? DePaul University, Wintrust Arena's primary sports tenant, posted this video of the basketball arena being installed on Wednesday. The court, named after DePaul legendary coach Ray Meyer and his wife, Marge, is made of maple and was produced by Connor Sports, which is also responsible for the NCAA Final Four courts each season. Both the DePaul men's and women's teams will play an exhibition game on Sunday, Nov. 5 at Wintrust Arena. 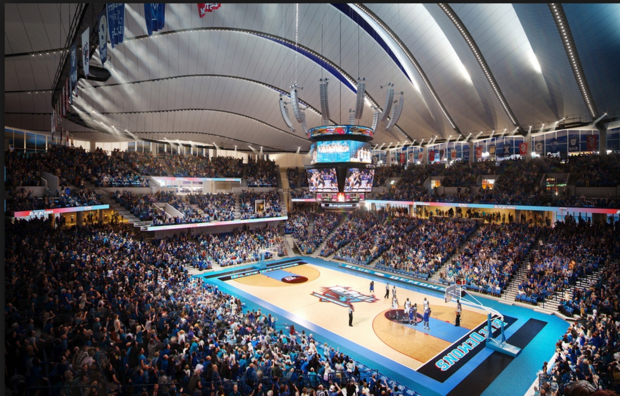 The men's basketball team is scheduled for 17 games at the new arena at McCormick Place this season, with the opener set for Nov. 11 against Notre Dame. The women’s team hosts powerhouse Connecticut at Wintrust Arena on Friday, Dec. 8. The Chicago Sky of the WNBA said it will also play its home games there next season, moving from suburban Rosemont.